Once home to the world’s largest textile mill complex, Manchester has emerged as a premier city in New England in which to do business, raise a family, and build one’s dream. 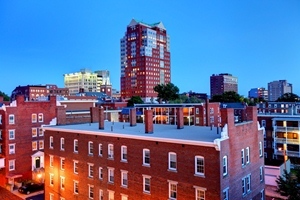 This vibrant and modern city’s strong economy is fueled by its proximity to Boston and its status as the business and financial center of northern New England. Manchester is within an hour of the Atlantic Coast Line and the beautiful White Mountains, which offer spectacular natural scenery. The combination of superb quality of life, top-notch entertainment, professional sports, and rich culture makes living and working in Manchester ideal. Dreams are born and built against the backdrop of this dynamic, energetic city. Manchester is a place in which entrepreneurs prosper; companies grow and succeed; families and individuals thrive; and the sense of community is constantly being strengthened. Read The New York Times article: "A Millyard Transitions From Textiles to Tech" about Manchester's resurgence as a tech hub.